Artist Emrys Plant asked me create a reflective text to accompany his October exhibition. Below are the details of the show. I will post the text once the exhibition is on. 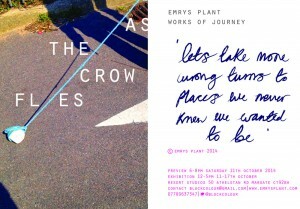 Emrys Plant participates in journeys as part performance, part ritual, part adventure and perhaps part whimsy but rarely as simple as a movement from A to B. ‘As the Crow Flies’ presents an immersive response to journeys that may be arduous, aimless, dangerous or hysterical, journeys where underlying thoughts are anchored somewhere off the safe shores of home. To accompany the exhibition Steve McPherson presents a reflective written work on journey. Exhibition 11- 17th October 12-6pm. Resort studios 50 Athelstan road, Margate CT9 2BH. Weekdays exhibition access call 07789637347 for viewing.